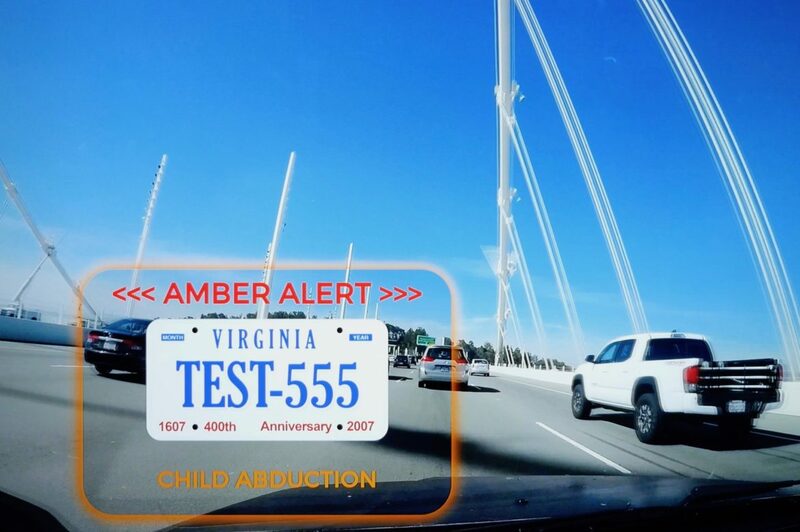 A simulated AMBER Alert encoded for AWARN on an in-car display projects information to the driver from inside the windshield. The upcoming ATSC 3.0 broadcast protocol will enable such warnings. The Advanced Warning and Response Network Alliance, a next-generation public safety coalition that includes public broadcasters, has formed an advisory committee with several new partners. Representatives from the the Federal Emergency Management Agency, the National Center for Missing and Exploited Children, the National Weather Service and the Association of Public-Safety Communications Officials will meet with AWARN Alliance members Monday in Arlington, Va., to help “create a road map” for the organization, said AWARN Executive Director John Lawson. “We need to focus on an end-to-end system, from alert originator to consumer device,” Lawson said. “We’ve previously focused on the middle piece, what happens in the TV station.” Alerts over the ATSC 3.0 AWARN system can include photos, surveillance video, storm tracks, evacuation routes, safety instructions, hospital wait times and other recovery information after a disaster. Disaster alerts now consist of simple tones or 90-character messages. AWARN, which now includes four of the largest emergency-alert originators, will meet at the headquarters of another new partner, the Consumer Technology Association, to brainstorm its future. Representatives could opt to take “the most minimal approach” by simply creating a best-practices manual, Lawson said. Or, more ambitiously, AWARN could grow into a cloud-based managed network, similar to public TV master-control facilities, supported by a nonprofit service bureau. One thing is certain: ATSC 3.0, the upcoming internet-protocol Next Generation TV, can turn emergency alerts into geotargeted messages transmitted to devices including high-def TVs, tablets, smartphones and connected cars — even if cellular networks are down. “Our public safety partners will help us define how to use those tools to create messages that save lives and speed recovery,” Lawson said. The organization, launched in April 2016, “has reached a point where people are starting to approach us,” Lawson said. He recently heard from the private weather industry, which packages images and data from the National Weather Service for commercial clients. “Companies want advanced weather information” such as real-time alerts about lightning strikes, he said. Private weather services make up a $7 billion industry with a 13 percent annual growth rate, he said. AWARN will soon be issuing a request for information to find other potential partners, Lawson said. The alliance hopes to have a beta version of AWARN alerts available for early-adopter television stations that launch Next Gen TV transmission in 2018. While the group is gaining new members, it’s also lost two. America’s Public Television Stations and Vegas PBS, a station active in public safety work, recently dropped out. Patrick Butler, APTS president, said that after joining AWARN in March, APTS “concluded quickly that their work and ours in public safety were complementary and APTS’s attention, with limited staff and financial resources, would be better focused on our broader public safety mission.” Member stations are working on FirstNet, a federal network of first responders, as well as the Department of Homeland Security and other congressional and government groups. Vegas PBS “is actively pursuing emergency communications strategies and public service media solutions through other organizations this fiscal year,” said President Tom Axtell. Current public TV alliance members are KET in Lexington, Ky.; KPBS, San Diego; UNC-TV, Chapel Hill, N.C.; WKAR, East Lansing, Mich.; and WNET, New York City.